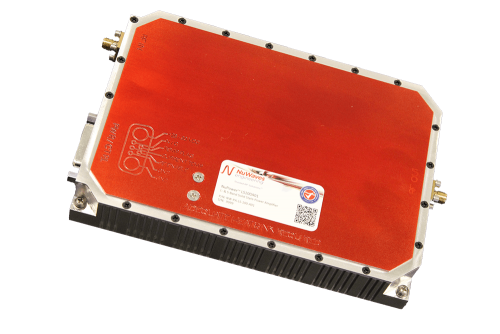 The NuPower™ LS100A01 L- & S-Band Power Amplifier is a small, ultra-high-power solid-state power amplifier module for CW operation that delivers a minimum of 100 watts of RF power from 2300 MHz to 2500 MHz to boost signal power levels of data links and transmitters for communications range extension, electronic warfare (e.g. electronic attack), etc. With 20 dB of RF gain, the NuPower LS100A01 module is configured for an input drive level of +30 dBm from the transmitter/transceiver. Based on state-of-the-art Gallium Nitride (GaN) device technology, the NuPower S100A01 provides a compelling option for size, weight and power (SWaP) constrained RF telemetry and military communication systems given its 29 cubic inch, 22.6 ounce enclosure and 45% DC power efficiency.